15 anglers again tonight with not a breeze in the air, and the sea like a mirror, perfect whiting conditions , but had the bigger ones turned up in numbers yet? From the off everyone was plagued with pin whiting , undersized dabs and crabs. Everyone kept plugging away and hoping to find the bigger fish , as it turned out only one angler blanked but it was a struggle for everyone. 1st place podium went to club secretary Simone Bone scratching out 5 fish for 1lb 12oz, 2nd on the night was Richard Chapman also finding 5 fish for 1lb 10 2/3oz, 3rd place went to Leon Smith with 3 fish for 1lb 2/3oz. No bonus fish but we managed to card 36 fish between us and although tough going was an enjoyable evening with plenty of the usual banter.Lets hope the whiting turn up in numbers for next week. Next weeks match is at Weybourne this will be a rover , but we have a guest comng from Norwich university who is keen to take photographs of groups of anglers fishing so please try not to walk off miles on your own so we can maybe get a group shot. 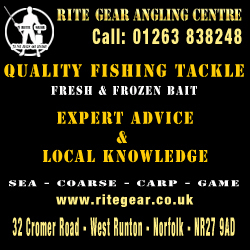 As always we will be taking bait orders and booking in at the shop or on here, dont leave it until last minute as we need to make sure diggers get enough in. 17 anglers arrived to quite settled conditions with plenty of fish out the day before everyones hopes were up. Unfortunately the fish didnt want to come out to play. With only 8 managing to card it wasnt the funniest of sessions. Taking third place with 2 fish for 9oz1/3 was Simon. In second place also with 2 fish for 10oz was Will and taking top spot with one big flounder was Gary for 13oz1/3. Next weeks match is at Overstrand hopefully with more fish. 19 anglers arrived to a rather choppy looking sea. The match was run as a rover. With serveral anglers making the long walk to the left and some to the right it proved to be a mixed bag. Weed was a pain for some but not for everyone. Although the conditions looked good and the reports were too it proved to be a hard match. With only 9 out of the 19 managing to find sizable fish. In third place this week with 4 fish for 1lb 8oz was Russell. In second place was Will with 3 fish for 2lb 3oz. Taking top spot with 1 fish for 2lb 15oz2/3 was Kimberley. Next week we are at Cley hope to see as many of you there as possible. Another good turnout this week with 20 anglers with high expectations. With the sea roughed up a bit people were hoping for whiting , dabs and maybe a lucky bass and even a early cod if they were here yet. As the match went on though it turned out to be a lot harder with a lot of red weed about and the attack of the flies. There were a few early bass caught unfortunately they were undersize Charlie coming close with 35cm and andy bunn with a 24cm flounder. In the end there were only 4 sizable fish caught all bass. Now onto the results pete hansell had 1 bass for 68points 1lb 6oz2/3 giving 4th place Richard chapman had 1 bass for 92points 1lb 14oz2/3 giving him 3rd Paul Rickard had the biggest bass of the evening 57cm giving him 174 points which was 3lb 10oz and 2nd place now on to the winner who never manages to catch here and snapping his rod at the start was Russell taylor who managed 2 bass for 214 points 4lb 7oz1/3 well done.